Learn how to make the Rainbow Droplet Necklace using pretty Swarovski and glass faceted rounds. 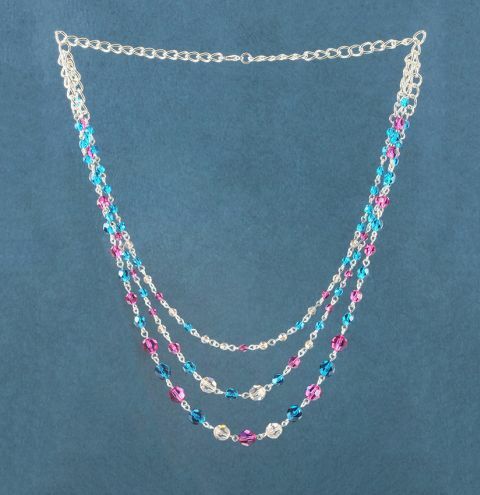 Create a long length of bead chain for the lowest layer of the necklace. Then create a slightly shorter length and a final shortest length for the layers. Create each link by threading a bead onto an eyepin, trimming and looping to secure the bead on the pin. There will be a mixture of single beads on pins and 3 beads on an eyepin. Attach the beads in the following order as shown on the image. Cut 2 lengths of chain measuring 4". Attach these to each end of the longest length of beaded chain. Cut 2 lengths of chain measuring 4 links. Attach these to the 4" chains on either side and attach the medium length chain to these. Repeat this with 2 lengths of 5 links for the shortest length of beaded chain. See the image for where to attach the short lengths of chain. You may wish to alter the beads on the necklace so that the layers sit evenly apart. Once you are happy with your necklace layers, attach a lobster clasp at the back of the necklace.